Posted on 23, January 2019 by EuropaWire PR Editors | This entry was posted in Education, Energy, Gas & Oil, Environment, Netherlands, News, Sports, Sweden, Technology and tagged Bridgestone World Solar Challenge, Delft, fossil free living, life without fossil fuel, Magnus Hall, Maud Diepeveen, NunaX, Nuon, Nuon Solar Team, race, Sasol Solar Challenge, solar car, solar cars, solar racing team, sponsorship, Vattenfall, World Solar Challenge. Bookmark the permalink. STOCKHOLM, 23-Jan-2019 — /EuropaWire/ — Vattenfall has signed a new four-year sponsorship deal with the solar racing team from Delft. Ever since competing in the World Solar Challenge for the first time in 2001, the Nuon Solar Team has been sponsored by the power company Nuon. From now on, the team will compete as ‘Vattenfall Solar Team’. The team has been sponsored by Vattenfall’s subsidiary Nuon since 2001 and has won seven out of nine times in the biggest solar race in the world in Australia. ‘This is a special sponsorship deal that fits well with our goal of making fossil free living possible within one generation. This team represents the next generation and demonstrates how far you can get with technical know-how and innovation,” says Vattenfall’s President and CEO Magnus Hall. Vattenfall has been present in the Netherlands since 2009 as owner of Nuon. 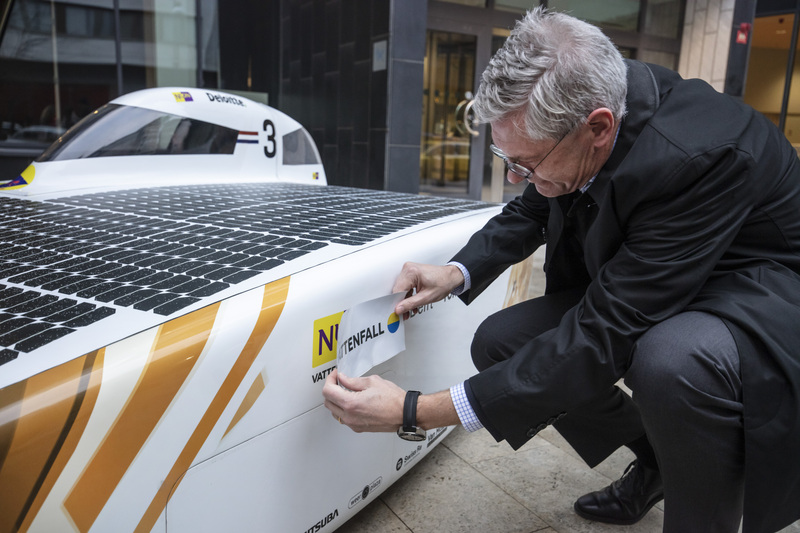 When Nuon now changes its name to Vattenfall, the Delft University of Technology’s solar racing team will compete as “Vattenfall Solar Team” as from 2019. At the upcoming world championships “World Solar Challenge” in Australia in October the Vattenfall Solar Team will race under the slogan: “It’s Possible!”. The new Vattenfall Solar Team was presented on Tuesday in the Dutch city of Delft. The team comprises 16 students. This year, the members of the team will build their tenth solar car. The ‘Nuna’ solar car has won the Bridgestone World Solar Challenge in Australia on seven occasions, has taken silver twice and is now the reigning world champion. The ‘Nuna’ car has also won the last three editions of a similar long-distance race in South Africa, “Sasol Solar Challenge”. Both races are held every two years. In October, the students from Delft University of Technology will compete in the World Solar Challenge in Australia for the tenth time in a row. The sixteen new team members are building a brand new solar racing car for the event. The anniversary edition of the solar car will have a special name: ‘NunaX’. “It’s a name that fits with the vision of the new team. In mathematics, X represents the unknown variable: we don’t yet know how we will achieve our goal. The path to get there is still a mystery. Even so, we believe it is possible for us to be crowned world solar racing champion for the eighth time in Australia – and to achieve a life without fossil fuels within one generation,’ says the team leader Maud Diepeveen. Vattenfall ranked "Leader" by Sustainalyctis, an improvement from last year’s ranking – where the company was rated as "outperformer"